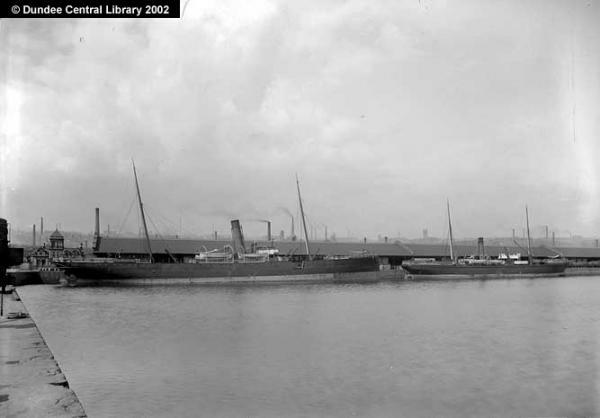 James R Fleming was a farmer's son who spent nearly forty years as an employee of the Dundee, Perth & London Shipping Co at its main office in Shore Terrace, Dundee. Thomas Couper, manager of Dundee, Perth & London Shipping Co. where Fleming was a clerk and later the collector. James Fleming was born in Glenshee in 1829 to David Fleming and Elspeth Ferguson. By 1839 his father was tenant of Franklyden Farm on the Fingask Estate of Sir Patrick Murray Threipland, in the parish of Kinnaird,(as shown in the tack between Sir Patrick and David Fleming and John Fleming, his eldest son). He is at Franklyden in the 1841 census along with his parents and older siblings, John and Susan. He probably began working for the Dundee, Perth & London Shipping Co. in the late 1840s. In the 1851 census he is lodging with the Finlay family at 4 Dallfield Walk, Dundee but he appears briefly in the Perthshire valuation roll as tenant of Franklyden Farm, in succession to his father,1856-1858. About the same time he is being offered to Sir Patrick Murray Threipland as a character referee in James Heggie's application to be tenant of Franklyden. It is probable that this James Heggie married James Fleming's sister, Susan. In his letter to Sir Patrick, Heggie describes James as working at the London Shipping Co.'s office, Dundee. By the time James Fleming marries Jessie Ogilvie on 28 January 1858, both of his parents are deceased. 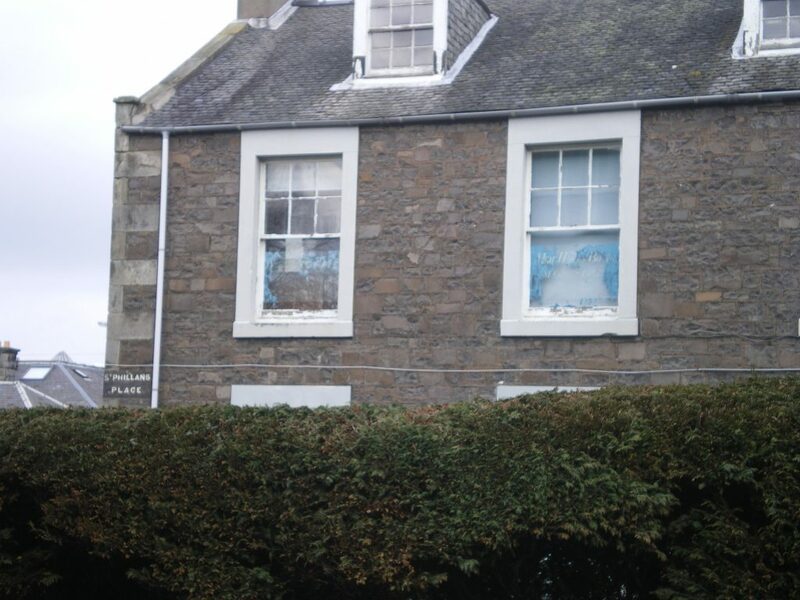 Jessie's father George Ogilvie is also deceased but her mother, Isabella Greig, is still alive and it is likely that it is her house in McVicar's Lane, Perth Road, Dundee that is the one referred to as the venue for the ceremony. James and Jessie's first few homes are all in the Perth Road area. The first time James appears in the directories is as a clerk for the Dundee, Perth & London Shipping Co is 1861. James R Fleming came from farming stock in Glenshee, moving with his family to the farm of Franklyden, parish of Kinnaird in the Carse of Gowrie, Perthshire. He joined the Dundee, Perth & London Shipping Co. as a boy and over a career of nearly forty years rose through the company “by perserverance and diligent attention to his duties” to be clerk and eventually collector. 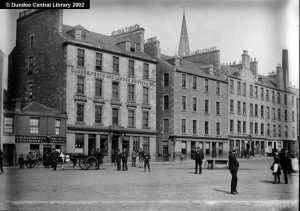 By the time of the 1871 census James and his wife have his mother-in-law living with them at 13 Thomson Street, Dundee and they are in comfortable enough circumstances to have a domestic servant living in. 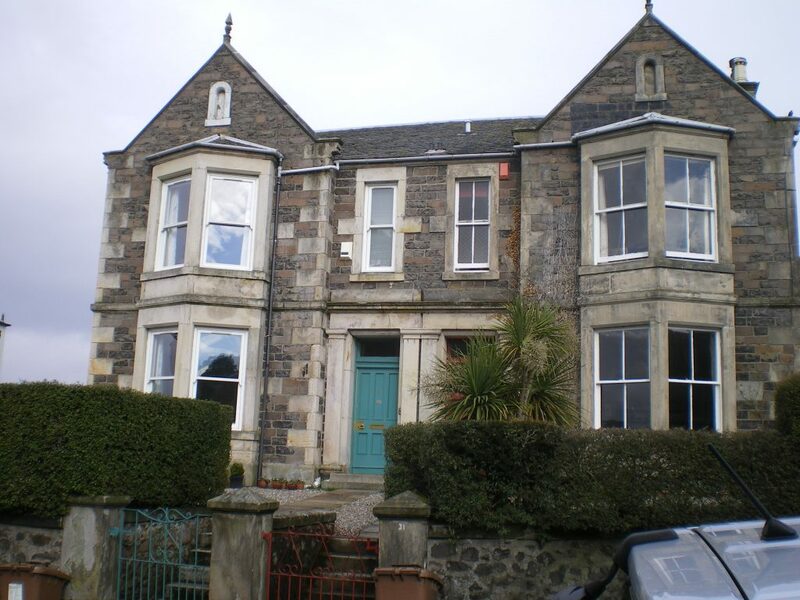 After 1874 James Fleming is described as a collector with Dundee, Perth & London Shipping Company and he re-locates to 6 St Phillan’s Close, Newport, Fife. In 1881 Jessie’s mother is still living with them and they still have a live-in domestic servant. 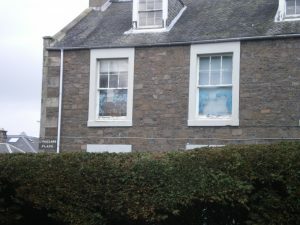 The property is now 29 Cupar Road, Newport, but the street sign for St Phillans Place can be seen on a house a little further down the hill on Cupar Road. In his will James left everything to Jessie. The value of his estate was a little over £850. Old Parish Record. Kirkmichael. Baptism. 6 September 1829. 370 30 89. ScotlandsPeople website. 1861 Census Scotland. 2nd District Dundee. 282/2 ED13 p.23. Ancestry website. Statutory Registers. Dundee. Marriage. 28 January 1858. 282/2 46. ScotlandsPeople website. Dundee Directories 1861-1865. Local Studies, Central Library, Dundee. Dundee Directories 1867-1870. Local Studies, Central Library, Dundee. Dundee Directories 1874-1886. Local Studies, Central Library, Dundee. Statutory Registers. Forgan, Fife. Death. 16 May 1886. 431/29. ScotlandsPeople website. Burial records for Forgan Churchyard and neighbouring cemeteries do not survive for this period. Information supplied by Andrew Dowsey, Fife Archives, ON at Fife Collections Centre, Bankhead Central, Bankhead Park, Glenrothes. Dundee Advertiser, Monday, 17 May 1886. British Newspaper Archive. British Library website. Dundee Directories 1878-1885. Local Studies, Central Library, Dundee. Dundee Directories 1861-1886. Local Studies, Central Library, Dundee. Estate Records. Threipland of Fingask Papers, 1856. MS169/3/1/1(268). Perth & Kinross Archives, A K Bell Library, Perth. Dundee Directories 1861-1886. Local Studies, Central Library, Dundee. Estate Records. Threipland of Fingask Papers, 1839. MS169/3/1/1(222). Perth & Kinross Archives, A K Bell Library, Perth. 1841 Census Scotland. Kinnaird, Perthshire. 368 ED2 p.9. Ancestry website. 1851 Census Scotland. Dundee. 282 ED39 p.33. Ancestry website. Valuation Rolls. Kinnaird, Perthshire, 1855-1858. CC1/8/1/1-3. 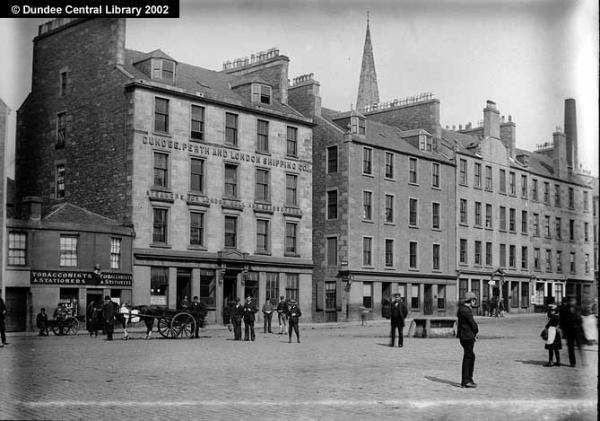 Perth & Kinross Archives, A K Bell Library, Perth. Estate Records. Threipland of Fingask Papers, 1856. MS169/3/1/1(268). Perth & Kinross Archives, A K Bell Library, Perth. 1881 Census Scotland. St Peter, Dundee. 282/1 ED20 p.27. Ancestry website. Dundee Directory, 1858/59. Local Studies, Central Library, Dundee. Dundee Courier, Monday, 17 May 1886. British Newspaper Archive. British Library website. 1871 Census Scotland. St Peter, Dundee. 282/1 ED3 p.37. Ancestry website. 1881 Census Scotland. Forgan, Fife. 431 ED4 p.8. Ancestry website. House names and old addresses in Newport and Wormit. 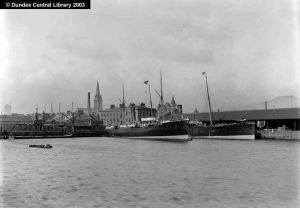 Newport, Wormit and Forgan Archive. www.newportarchive.co.uk. Testamentary Records. Cupar, Fife. SC20/50/59. Scotlands People website. Testamentary Records. Cupar, Fife. 3 August 1886. Calendar of Confirmations and Inventories, 1886. Local & Family History, A K Bell Library, Perth. Thanks to the staff of Local Studies, Central Library, Dundee; Local & Family History, A K Bell Library, Perth and Perth & Kinross Archives, A K Bell Library, Perth. The information above about James Robertson Fleming has been collated from a range of digital and hard copy sources. To the best of our knowledge it is correct but if you are relying on any information from our website for the purpose of your own research we would advise you to follow up the sources to your own satisfaction. If you are aware of an inaccuracy in our text please do not hesitate to notify us through our Contact page.